We provide spray foam insulation services for Residential, Commercial, Farming… you name it, we insulate it! NES has been performing insulation in the Minneapolis area for more than 20 years. We are the largest contractor in the Midwest and can handle any job, big or small. Whether you are looking for spray foam insulation for your home roof, attic, basement, wall insulation or a commercial building or structure, NES has a solution for you. 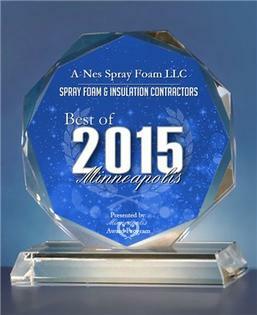 NES spray foam insulation services are available in the Twin Cities & Surrounding Areas. Free Infrared Inspection, CALL NOW… Don’t Wait! At NES Spray Foam And Coating, we’ve built our livelihoods on insulating people’s homes. Call now and we will do an infrared inspection and estimate for FREE!!!! Call now and talk to the owner about it! Our work is good. We promise. Behind that promise, we want you to know that we back our work with a satisfaction guarantee. We know you will like the end result of our work. We also specialize in raising and leveling your settled concrete! Sometimes, concrete surfaces, which are rigid and without flex, tend to crack or break depending upon what’s happening beneath the surface of the ground upon which they rest. Fortunately, in many cases, it is possible to minimize and repair the damage the ground’s movement has caused. David Baker from Ham Lake, MN said: “In this day and age it is hard to trust or find a contractor like your company. From the beginning with you and your vast knowledge and no B S type or approach. Informing and educating us on insulation and air flow. Then your crew arriving and being nothing short of professional. They did not even walk in our house without having drop cloths to protect our carpet to putting plastic everywhere protecting from overspray. Then the final clean up Yo9u told us that your goal was that when your crew was done we would not even know there had been there because of there cleanup. Well, mission accomplished. Scott Hermon from Andover, MN said: “Scott, Just wanted to say that your crew did a awesome job ! !